Rod licences are an essential part of angling. It's the Environment Agency's role to enforce rod licences in England. I was one of the many Environment Agency fisheries officers out in force this spring checking fishing rod licences. It’s a necessary part of the job – we don’t like spoiling someone’s day out, but if you go fishing you need a licence - it’s the law! More importantly, all the money we get from licence sales, £23 million last year, is ploughed back into work that protects and improve fisheries. So buying a licence is a good investment for angling and the environment. Each year around the start of the season, we carry out several rod licence blitzes, when we try to visit as many rivers, lakes and canals as we can. Each fisheries officer will use their local knowledge to visit the fisheries that some anglers may think are ‘off the beaten track’. As with angling, targeting these ‘backwaters’ can often net us a good ‘catch’. My patch is Manchester, Merseyside and Cheshire. Over the 2 May Bank Holidays alone we visited more than 200 fisheries. 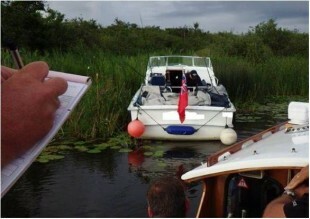 Licensed anglers were only too pleased to see us out on the banks, catching those who were intent on cheating others. We were indeed kept busy: out of the 2445 anglers we checked across the North West, 244 thought they could get away without having a licence! Across England, we checked 13,000 anglers and 965 were fishing illegally. If an angler can’t produce a licence or our database shows they don't have one, we will issue them with a ticket, and a court summons usually follows. Some unlicensed anglers will try to make a quick getaway but they don’t get very far. We work in teams, moving along the bank from opposite directions,to catch up with anyone trying to evade us. Sometimes they try to palm us off with false names and addresses, but we verify identities and car number plates on the Police National Computer. Anglers go fishing to enjoy themselves, and it is a very enjoyable past time. So surely sitting there looking over your shoulder, wondering whether you’ll asked for your licence spoils it, especially when a licence is only £27 for a year! Some anglers we met confessed that they had heard we were about and didn’t want to risk it, so had bought a licence, a wise move! You can even buy online so there’s really no excuse to not having one. We want everyone to go fishing; it’s a great sport and a great way to enjoy the outdoors. Anglers contribute over £23 million to work to protect and improve fisheries, so buying a rod licence isn’t just the law, it’s great for the sport and the environment too! Don't always take wallet with me fish Do they check data at time of stopping ?? All anglers must carry their rod licence with them when going fishing. Only official Post Office receipts and email confirmations can be used. Enforcement Officers will conduct checks to confirm if licences are valid and will issue offence report forms to any anglers that they suspect of committing offences. This requirement is within the Salmon and Freshwater Fisheries Act 1975. Only Environment Agency bailiffs and police officers have the power to ask anglers to produce your licence. This is stated in section 35 of the Act. Anglers cannot request for another angler to produce their rod licence. The Marine and Coastal Access Act 2009 removed this power. With regards to privately owned fisheries and angling clubs. Some have their own bailiffs or staff who check that anglers using their waters are allowed to do so. These private bailiffs are able to enforce their fishery or club rules. If the rules specify that anglers must show proof of rod licence before they can fish, the fishery or club is within their rights to refuse entrance to anglers who can't. We trust you find the above information useful. Why are the prosecutions for those not having a licence not shown on the E.A. web site? I buy a license under protest! Why is it we are the only sport that has to pay a tax to the government every time we want to partake in our chosen sport, even when we pay the event owner to use his private facility. The licence fee does not go back to these people so why is it not a requirement only for river fishing. Why also is it that other sports on the river can cause as much damage as they want without a fee. The fishermen foot the bill! This a very unfair TAX that applies to only one sport. Thank you for your blog regarding the need to pay for a licence . Other sports/pastimes do indeed pay for the use of Rivers example Boat registrations . You failed to respond to the above question : why enforce licences on private fisheries which rercieve no help or benefit from licence fees? £30 a year for a sport u love is not much is it??? Just recently I had planned to go fishing but I didn't have a rod licence so my wife said she would sort one out online for me whilst I went I got to the lake and started setting my rods up waiting for her to contact me to let me know everything was okay to fish , whilst I was waiting somebody from the environment agency turned up to check for my licence I explained to him that I was waiting for confirmation and that my wife was in the process or sorting it out he seemed very helpful but said he had to issue me a ticket for planning to fish without a licence because my rods had been set up , I was never planning to fish without a licence I was waiting for a call before I started fishing , I have now received a letter telling me that I am being charged for this and taken to court , I have searched multiple websites and can find nothing that mentions planning to fish as being an offence , I presented the agency officer with the rod licence details before he had left the fishery and I find this a bit hard to stomach if I'm being honest. Please call us on 03708 506506 and explain the situation to the advisor, provide the case reference and the officers name (the case officers name will be on the bottom of the letter received). The advisor will transfer you to the enforcement team who will be able to discuss the particular details of the case. If there is no name on the letter, any other case officer will be able to help. If you plan to fish in the future at least once per year, then why not sign up and get you licence on line or at a post office, and pay but direct debit if that suits your circumstances, but don't bleat because you did nothing to get your licence before hand. If you haven't got your licence beforehand don't go fishing. A simple matter of priorities. Call the police and state code 116/11, it's the police code for poachers and they have to attend ! How can I get an EA bailiff to come to my local fishing pond in everingham road cantley doncaster to check licenses as I'm sick of people fishing which I know shouldn't be, and they keep taking the fish out to eat. I would like to remain anonymous too. State code 116/11 to police and they have to attend , poachers code! My direct debit has been in place & triggered for over a month now but still no licence has been posted to me from the EA and it's the 11th March! Disgraceful - what's the problem and how do I go fishing safely? Hello Peter, Sorry to hear that your licence has not arrived. need to pay for a licence . source of income for our fisheries work. PLEASE come and check for licences along the river Medway in Maidstone (particularly town centre to East Farleigh). Lots of fishermen, and far too much debris left behind. Just been part of a swan rescue, it was entangled in fishing line with a large weight attached. I live in Bedford for now and I love to fish. I am flabbergasted how people here are allowed to fish the river here ad hoc ( The Great Ouse) and allowed to take their catch home in bags after having kept them in buckets all day. I have lived here 8 years and I have never encountered a bailiff. I duly pay for my license, but Im beginning to that I'm one of the few. What is the EAs advice on when an angler wants to report suspected illegal fishing? Grateful for a proper reply. Do private fisheries as commercial ventures need a licence? If so how can I check that a fishery has a correct licence and are there any rules they need to abide by, especially regarding local the environment. If I have purchased a rod licence and have lost it while fishing and have not bought a replacement yet will I still be able to fish ? If you have lost your rod licence we can order a replacement for you but there is a fee of £5 to cover the reprinting of the licence. Please call our customer service team on 03708 506506 and a member of our team will be able to arrange this for you. Once ordered, the licence will arrive within 15 working days, you can still fish during that time with your licence number and proof of ID, Our team will be able to provide you with the licence number when you call. A group of young men have for many weeks now fished one of our club waters without unhooking mat or even a landing net. They are not members and have been asked to leave around 6 times to date. Now they have been night fishing, 3 nights consecutively, they also leave loads of rubbish. How can we put a stop to this, the police do not seem interested. Hi. I live in Tenerife and travel through Spain France etc and purchase relevant licences on my journey. I arrive in England and go to buy a full rod licence even though it is for only 2 months fishing. So I thought to save a little money I will buy day licences when required. Problem, the post office can't sell me a rod licence because my home address in Tenerife is obviously not recognised. I have to give the address of a friend. Why do they not have a system for foreign tourists. On the many occasions I have purchased a yearly licence they never arrived and the receipt says it it only valid for a month. My thought is that if I paid for a licence I am fishing irrespective of the months curfew. The EA needs to get its actions together. A rod licence covers the licence holder only, so if your partner was to go fishing with you, they would require their own licence for them to fish. Thank u so much this is the answer i was looking for. Strait. Have a good fishin to everyone. How long does it take from being issued the bankside paper work for fishing 3 rods whilst only having one rod license to hearing what fine you will have to pay ? Why have so many anglers not received there licences yet,you have had thier money but failed to deliver,so stop talking from the high moral ground and make an apology about your understaffed rubbish distribution system. & ps save me all that gumf about you don't need you licence to fish just make a note of the code,it just a rubbish excuse for a useless operation. Why has the 2017 license not arrived paid for on the 5 march. Some anglers need the license to renew club membership for the new season. 1 april when it was supposed to arrive by. There has been a delay in anglers receiving their paper licence. This was due to a technical issue that has been resolved. Licences are now in the process of being sent. You can still fish using your confirmation e-mail, text or receipt and some identification. If you need your licence number please call us on 03708 506506. We can check your details and give you your licence number. We apologise for and inconvenience caused. Organised a fishing competition last Feb for a national cancer charity. Has been organised for the last 15 years and has raised a considerable amount for the charity. This year I did not appreciate an EA officer turning up to check all participants licences. I am sure it was a quick way for this person to achieve their checking quota for the week/month but looked as though we had invited this person to check everybody. All 45 anglers showed him their licence. Their is a strong indication that anglers will not support the event next year because of this individual checking everybody. It was the cheapest of cheap shots. How is someone new to the hobby supposed to know they need a rod licence when fishing on a private lake that doesn't mention it anywhere or ask if they have one? I am annoyed that my partner is being taken to court for not having a rod licence when he didn't know he needed one. Where is it advertised or made known to people? Private lakes should have information available regarding the need for a valid rod licence and check them. We would hope that anyone new to the sport would be informed when purchasing or hiring or borrowing equipment to fish. Anyone aged 12 or over who wants to fish for salmon, trout, freshwater fish, smelt or eels in England, Wales or the Border Esk region of Scotland needs a rod licence to fish with a rod and line. A licence is not needed in the River Tweed and its tributaries as it is classed as a Scottish River. A licence is needed to fish on both public and private waters, and when fishing for these species in river estuaries, inshore fishers and up to six nautical miles at sea. Anglers must have the permission of the land owner and whoever owns the fishing rights, for the location they want to fish. There are a number of different rod licences available. I find it hard to believe that anyone would think to look at the Gov.UK website before taking up a new hobby. Private lakes should have signs up to state whats needed & the rules, ours does but there is no mention of a rod licence nor did they ask, there is no mention of it o their website either. Maybe that should be made law before being able to prosecute people. As for the post office which we no longer have, I have never seen anything regarding a rod licence on view nor do we buy the angling times. Seems my partner slipped through the net! You can call us and ask to speak to the Enforcement Team regarding this matter. Please have the details of the summons available or when and where this happened. Customer services are open 0800-1800 Monday to Friday. I have a license and I am new to fishing. My question is if I am fishing and someone is sitting beside me and watching me fish and they do not help me or participate in catching any fish in any way does this mean that they still need a licence? It's currently possible only to upgrade from a short-term licence to an annual licence of the same type. An annual non-migratory trout and coarse licence would need to be bought separately once the short-term salmon licence has expired. I've lost my license how can I get a replacement please? Good Morning, You can purchase a replacement rod licence over the telephone. The replacement fee is £5.00 and can be paid using a valid debit or credit card. The telephone number to call is: 03708 506 506. Rod licences take 10 working days to be printed and posted out but once you have paid the replacement licence fee our customer service advisor will give you your rod licence number that will allow you to fish again legally. We do recommend that you take some form of identification with you until your rod licence arrives.